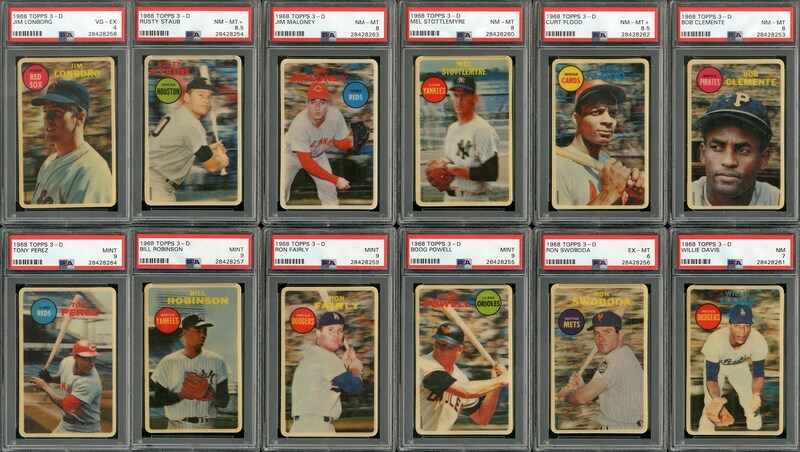 THIS IS A COMPLETE SET OF 1968 TOPPS 3-D CARDS. Offered is a fresh to the market high grade set of 1968 Topps 3-D cards, one of the most difficult and highly desirable Topps TEST ISSUES ever created. Limited to 12 cards, the set was issued is very scarce quantities around Topps headquarters in Brooklyn, NY. However, these cards were only on a few store shelves, and most known examples originate directly from the factory through Topps employees. All these cards are newly graded, and all submitted by Leland's. This set has resided in the same collection for several decades, and have never been circulated trough the hobby, and is very high grade with more than half the group graded by PSA NM-MT 8 or higher, including the set's most coveted card, that of Hall of Famer Roberto Clemente. In addition, some of these grades are some the highest ever recorded at PSA including the Boog Powell and Bill Robinson cards, which are each one of FOUR graded at the PSA MINT 9 level, each with two higher. This set is registered on the PSA Set Registry under Leland's Classic 2018 and is ranked as the #5 All Time Finest set with a GPA and Set Rating of 8.15. Includes: PSA MINT 9 - 4 cards w/Ron Fairly, Tony Perez, Boog Powell and Bill Robinson. PSA NM-MT+ 8.5 - 2 cards w/Curt Flood and Rusty Staub. PSA NM-MT 8 - 3 cards w/Roberto Clemente, Jim Maloney and Mel Stottlemyre. PSA NM 7 - 1 card, Willie Davis. PSA EX-MT 6 - 1 card, Ron Swoboda. PSA VG-EX 4 - 1 card, Jim Lonborg. 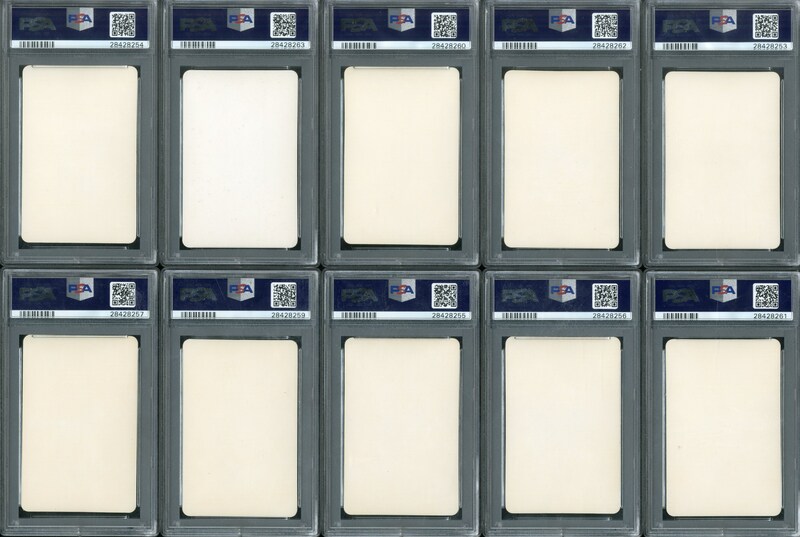 This is one of the nicest PSA graded complete 1968 Topps 3-D sets extant (#5 All Time Finest! ), with all cards fresh to the hobby, with high grade examples of many of the sets key cards. True investment potential.